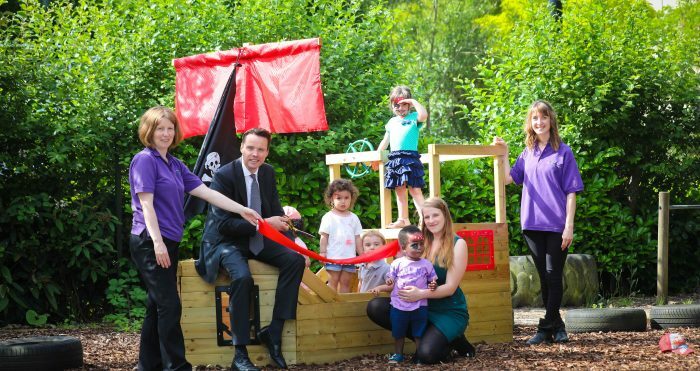 A new Pirate Ship has sailed into The Old Station Nursery’s garden at The Oxford Science Park and was officially opened by the Park’s MD, along with some trusty little pirates, on Thursday 15 June 2017. The nursery opened its doors at the Park after a £100,000 refurbishment of the building in January 2017. The new Pirate Ship is part of the nursery’s additional £1,000 investment into outside resources, offering great outdoor education for the children to enjoy the natural environment and encouraging learning, creativity, health, well-being, exploration and social skills. Ramona Kantschuster, nursery manager, The Old Station Nursery explained: “Learning through play is a vital part of child development and enables children to explore the world and acquire new skills. Our new Pirate Ship has been a huge hit with the children and offers a holistic outdoor learning experience, enhancing children’s imagination, creativity, and the way they interact with each other. The nursery offers daycare to parents and carers both on the Park and those in the surrounding area for up to 72 children from birth to five years old. To enquire about available places or to book a tour, please contact: osp@theoldstationnursery.co.uk or call 01865 777 167. Photo caption: “Ahoy! Pirate ship launches at The Oxford Science Park” L to R Annette McCullagh, Room Leader Babies, The Old Station Nursery; Piers Scrimshaw-Wright, MD, The Oxford Science Park; Eva, Riley, Almustafa, Darcey, the four little pirates; Ramona Kantschuster, Nursery Manager, and Rebecca Banas, Nursery Nurse, The Old Station Nursery.